A single mum from Coventry has picked up an award for helping to equip apprentices with new tech skills – as well as helping to make learning fun for schoolkids across the Midlands. Louise Campton, who runs Primary Goal based at the University of Warwick Science Park’s Business Innovation Centre in Binley, has already grown the company to seven permanent members of staff and is now looking to roll out her concept nationally. 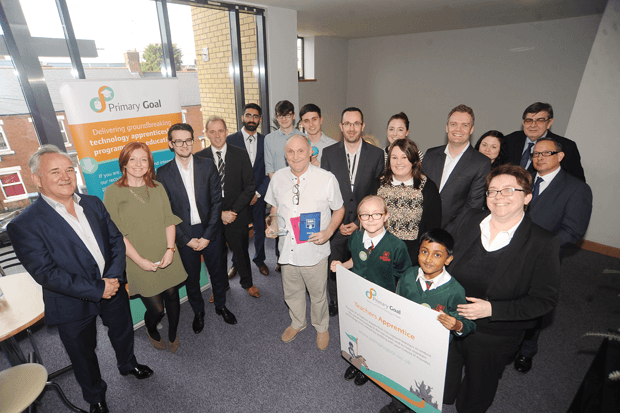 After receiving support through the Business Ready programme through the Science Park, Primary Goal picked up a Gold Award for E-learning from Apprentices4England and is now looking to grow the company further. The concept of the business, which was established a year ago, is to offer apprentices the opportunity to learn new skills and pick up recognised qualifications. Those apprentices, who have been supported by Microsoft Trainers, spend some of their time in schools, where they help the school make better use of IT. That includes, in some cases, the use of Google, Microsoft and Apple technology, including virtual reality. Pupils can be transported, through the technology, back to the blitz or ancient Egypt and can enjoy an animated and interesting learning experience with the help of the apprentices. Primary Goal currently works with 20 apprentices and with schools across Coventry, Warwickshire and the wider Midlands. Louise, who is from Bell Green and has two children aged eight and 13, said the help of Business Ready’s mentor Alex Toft had been invaluable. She said: “I don’t know if the business could have continued without the support of Business Ready. I’m a single mum and I’m also someone who has to put everything into my business, so I barely get chance to come up for air! “Alex helped me to focus on the crucial parts of the business that I need to work on. It’s easy to get involved with absolutely everything when it’s your business but he was just really honest with me and told me the things I should leave alone and where to focus my attention. “I am delighted how far the business has come and to pick up the award was a great achievement in such a short space of time. We are also working with some of the biggest names in the world of technology. “It’s benefitting our apprentices who are either going on to gain full-time employment with the schools they work in or picking up great experience and references for their future career. “The school benefits from putting IT to even better use and improving the way children learn – they love the VR side of things. Business Ready is part of the Coventry and Warwickshire Business Support Programme, which is part-funded by the European Regional Development Fund and Warwickshire County Council. Alex said: “The idea behind Business Ready is to have a genuine impact on small and medium-sized businesses that want to take that next step.